With the aid of local business organizations and artist groups, my business has evolved over the years and moved through a succession of larger and brighter workshops. 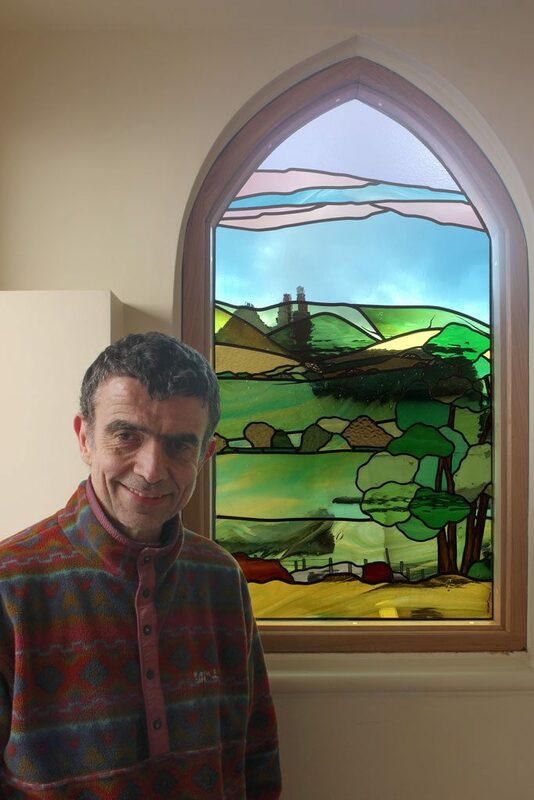 Through repetition and practice my skills as an artist and a glazier have developed over time and have been greatly enhanced by attending various courses in areas such as traditional glasspainting, silver staining and enamelling. I have worked hard to develop my own style in glass and particularly enjoy passing these skills on in introductory classes as this helps to encourage creativity and ensures that the craft will continue into the future. I especially enjoy creating panels for the exhibitions hosted by the British Society of Master Glass Painters (such as the recent Games 2012 Exhibition). These eventts aim to showcase the work of a wide spectrum of glass artists and demonstrate the diversity and creativity alive in the craft today. Glass is chosen to suit the location and ambient light, so the shade and quality of each piece changes with both the weather and the time of day. My aim is to produce windows which belong to their location, and which fully engage the viewer as well as providing decoration. Inspiration comes from the beauty of shapes and forms found in nature, and many commissions are inspired by the landscape and flora of the Peak District. My natural inclination is towards more abstract styles which make use of curves and the shapes which emerge naturally from them. The philosophy behind my work is to provide people with the opportunity to realize their ideas and dreams through the medium of light and glass. Over the last 17 years I have worked to develop my own individual style by using traditional leading techniques in unconventional ways. I particularly like the idea of using lead came and paint together to trick and delight the eye. Panels are designed in full partnership with clients, and have been exhibited nationally.